Change orders are a formal procedure for charging for “extra” work – items not included in the original fixed-price bid. Change orders are typically issued when work is added or changed in ways that add cost. In rare cases “deductive” change orders are used to reduce the amount of work and cost. A change order form typically describes the change in the Scope of Work, the cost, and any adjustment in the completion date caused by the change. It may include other information such as markup, when payment is due (usually upon completion of the changed work), and adjustments to the full contract price. Contractors have a legitimate right to charge a reasonable fee for changes requested by the owner, and to reset the completion date based on the extent of the changes. However, it’s unreasonable to charge for minor changes that do not cost extra or cause delays. It’s also unfair to charge for work that should have been included in the first place, but was intentionally left out of the bid. View the Change Order Clause in our Model Construction Contract. 10.1 The Owner, without invalidating the Contract, may order changes in the Work within the general scope of the Contract consisting of additions, deletions or other revisions, the Contract Sum and Contract Time being adjusted accordingly in writing. If the Owner and Contractor cannot agree to a change in the Contract Sum, the Owner shall pay the Contractor actual cost plus reasonable overhead and profit. 10.2 The Architect will have authority to order minor changes in the Work not involving changes in the Contract Sum or the Contract Time and not inconsistent with the intent of the Contract Documents. Such orders shall be in writing and shall be binding on the Owner and Contractor. The Contractor shall carry out such orders promptly. Owners. Many different conditions can generate a change order. Most commonly, the owner changes his or her mind. “I’d like you to move this window over two feet.” or “What would it cost to add built-in shelves to that wall?” or “Forget Formica, let’s go with granite!” These discretionary changes may also come from the designer, with the owner’s consent. Builder or Designer. Other times, change orders are caused when the designer or builder discovers a problem with the plan. An extreme case might be that the stairs are not going to fit as drawn, so the room or staircase has to be modified. Or it may be as simple as moving a door that interferes with another door swing. Code Inspector. In some cases, the code inspector may find a problem with the plans and determine that the work must change. For example, an additional beam needs to be added, an electrical sub-panel may be required. In a remodel, the inspector may require that you bring other parts of the house up to current code, for example, by adding new smoke and CO detectors. Hidden Conditions. Sometimes hidden conditions, like ledge in the soil that requires blasting, will generate extra work and a change order. Or there is decayed wood in the wall that was not discovered until the remodeling job was under way. Allowances. In a formal contract procedure, a change order is issued every time an allowance item exceeds the allowance price. Regardless, there should be some procedure for owners to agree in writing to cost increases for allowance items. Different Perspectives: Not surprisingly, contractors and clients often have different perspectives about change orders. Contractors routinely complain customers who comes to the work site every day with a new idea, or the one who wants the contractor to price every option, this way and that, after the job has begun. Owners, on the other hand, tell horror stories about the contractor who nickel-and-dimed them with change orders every time they asked for the smallest change or just wanted something done correctly. Be wary of contractors who bid on only part of a project and say they will handle the rest as change orders. Unless there is a compelling reason for this, get a fixed bid on the entire plan. Contractors have a valid point when they say that changes to the plan, after construction has begun, can be expensive and inefficient, and will lead to delays in the completion date. It costs very little to change a line on a drawing before soliciting bids. But it’s usually very expensive to move a wall or window when the building is nearing completion. So make sure you’re happy with the plan before you start building. A written change order (form, at left) should be issued before the changed work is begun. This gives the owner the opportunity to discuss the work and price and to negotiate if he feels the change order is not justified or priced unfairly. Some contractors are meticulous about issuing a change order every time there is an extra charge. Others, however, are sloppy or inconsistent during the course of the job. In some cases, the contractor catches the owner by surprise with a list of extra costs at the end of the job, which is never happy news to the owner. Under the terms of the model contract cited above, the owners are not responsible for any changes they did not approve beforehand in writing. The owner, in that case, would have a legal right to not pay for the changes. However, in most cases, owners pay the extra charges anyway, except for those that they feel are unjustified. Disagreements often arise over what is and is not a legitimate extra. The legal question is whether the extra work was or should have been included in the original Scope of Work – that is, the plans and specs that describe the work. For example, did the contract cover traditional window sills on the interior or did it include only “picture-frame” molding around four sides. The molding type may have been ignored in the plans, specs, and contract, leaving the issue ambiguous. Did the contract include one or two coats of exterior paint? Standard asphalt shingles or architectural shingles? Tile base or wood baseboard in the bathroom? Would all the nail holes be plugged and filled to match the finish on interior trim? Often the plans and specifications do not specify this level of detail. And it is nearly impossible to specify every last detail down to the nail. So, inevitably, the parties are left to negotiate based on their assumptions and their understanding of standard practice. The phrase “Well I assumed…” is often heard, but rarely convincing. Many contracts require (and all should) that work be done according to “manufacturer’s written instructions,” “construction industry standards ,” and in a “workmanlike manner.” This provides some guidance as most construction product manufacturers do publish detailed written instructions and their trade associations often publish extensive standards for proper procedures. For example, if a wood window states in a label on the window that the wood must be finished with at least two coats of exterior paint or stain prior to installation, then it’s pretty clear that the contractor should do this and not charge extra. It’s part of the job of installing these windows. Similarly, if the carpet contractor puts a seam in the middle of your doorway, you have the right to get this fixed, because the Carpet and Rug Institute (CRI) Standards for Installation of Residential Carpet states clearly in Section 5.1 that “ Seams are not perpendicular to doorway openings.” I had this problem with a carpet retailer, who uses independent contractors as installers. On producing this standard, I was able to get the new bedroom carpet removed and replaced at no cost. Where it is unclear what is a reasonable standard, then you will have to negotiate and hopefully reach a compromise. When these issues end up in court, expert witnesses spar over what exactly is “standard industry practice.” In construction, these may shift over time, have regional differences, or vary from one contractor or architect to the next. Best to make your expectations clear ahead of time in the plans and specifications. Equally important is to find a reliable contractor with a strong reputation for quality and good customer relations. Find someone whose quality standards are similar to your own and you will probably be happy with the work. The best solution to change orders is minimize them by starting out with a well-define Scope of Work and clear plans and specifications. These should define, with as much detail as practical, what work will be included in the project. The best contracts also contain a list of “Exclusions” that clarifies for all parties what is not included in the contract price. If anything is unclear in the Scope of Work, get clarification in writing before signing the contract. Measurable quality standards should also be included in the specifications where it makes sense. In addition to citing specific industry standards, such as the TCNA Handbook for ceramic tile, you can add your own commonsense expectations. For example, your contract might specify that the new light-colored paint completely cover the old, dark paint. Or that the finish flooring in the addition will match the level of the existing finished flooring. Don’t make assumptions! The contractor knows more about these issues than you do, so you may need to study up on construction standards or call in a third-party expert (architect, engineer, contractor) for an outside opinion to help you fine-tune the plans and specs. A reduction in change orders is a side effect of a good contract that communicates clear expectations of all parties. Similar questions about “extras” arise in other purchases that you are more familiar with. For example, when you buy a new car, you probably assume that it will have a spare tire, but not all do nowadays. You might also assume that it comes with floor mats, until you find out that the dealer wants an extra $200 when you go to pick up the car. If you think the floor mats should be included, you will probably negotiate and maybe refuse to pay the extra charge. Or if you got a great price on the car, you may decide it’s not worth fighting about. It’s a judgement call based on the context of the overall deal. Some unscrupulous contractors intentionally leave out necessary items so they can be the low bidder, and then make up the difference on the “extras”. This is a time-worn tradition in public works project. After all, the Big Dig tunnel project n Boston started out with an estimate of just over 2 billion dollars and ended up costing over 15 billion dollars – over $24 billion with interest! But just like the city of Boston needed to get the job completed, so do you in most cases. So you either pay the contractor for the extra work, hire someone else to finish the job, or do it yourself. If all the extra charges show up as a surprise at the end, you have a strong case not to pay them — especially if the contract stipulates that all changes must be documented, priced, and agreed to in a written change order before the work is done. If, on the other hand, change orders keep piling up over the course of the job, and you suspect that the contractor is trying to take advantage of you, you may have a legitimate reason to dispute the charges, or in extreme cases, terminate the contract. In that case, you would probably want to speak with a lawyer first. But the best approach to construction disputes, always, is to avoid it. Start out with detailed plans and specs. Choose a contractor with integrity. And be suspicious if one bidder is far below all the others. He probably left something out, either intentionally or by accident. Sooner or later, you will have to pay for the extra work. A simple Change Order form is reprinted below. Click here to download our Printable Change Order Form The free change order form is provided by construction attorney Gary Ransone. For further information on construction forms and contracts, visit Gary Ransone’s Contractor’s Legal Kit. Payment for this Change Order is due upon completion of this Change Order work and submittal of invoice by Contractor. This Change Order, by agreement of Owner and Contractor, is incorporated by reference into the Construction Agreement between Owner and Contractor. All terms and conditions in the “General Conditions” section of the Construction Agreement between Owner and Contractor apply to this Change Order. 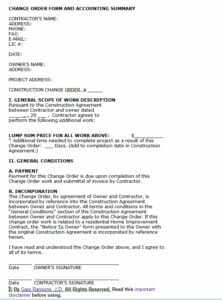 If this change order work is related to a residential Home Improvement Contract, the “Notice To Owner” form presented to the Owner with the original Construction Agreement is incorporated by reference herein. I have read and understood the Change Order above, and I agree to all of its terms. © By Gary Ransone, J.D. All Rights Reserved. Read this important disclaimer before using. Can Contractor Change Price Without Change Orders? On a pretty large remodel job, the contractor has not abided by the contract terms he has written up. He insisted I was limited to a “discount” granite slab he had already purchased, and if I wanted to pick my own slab, there would be a $1300 extra charge. In the language of the contract, any item that is already installed cannot be rejected. So in effect he limited me to accepting granite he already had in supply, which was not reflected in the contract. I was supposed to get my choice of granite in two bathrooms, but he said that would be too expensive so I needed to pick one type of granite top for both bathrooms. Then the granite he supplied looks substantially different in tone than his sample. He did a horrendous match job where the granite countertop was cut for an L peninsula. The color goes from pale gold to dark brown. I was supposed to get my choice of vanity cabinets, but he had the vanities delivered before I chose a style or color. He won’t change them so I will now need to paint the cabinets to match the countertops. The contractor says that I am unhappy about everything. I’m not, but I am unhappy about the parts of the contract he has not abided by. Early on we had a problem with him installing a type of tub, without first giving me any choices. He did pull that tub and replaced it with the one I selected, but he seems to overreact to my not accepting his mistakes. I asked about bigger vanities, and the cost. He never got back to me, but just installed larger ones (that I had not chosen). He is now mentioning how my job has cost him twice the money and time he planned, and that he is losing money. He said he “will not absorb the cost of any extra work.” We have only agreed upon two change orders, and so I am worried about him tacking on a bunch of surprise charges for me. I believe he either underbid the job, or figures me for a pushover since I accepted the granite he pushed for, even though the contract mentioned nothing about being limited to “discount” or already purchased stock. The contract specifies that all extra work involving added cost will be accompanied by a change order. We only have agreed to two. How likely is he to prevail if this goes to litigation? I’m sorry to hear things are going so badly on your job. Not that it’s much consolation, but disputes over change orders, specifications, and cost overruns are very common. The good news is that they are usually resolvable if both parties are willing to listen to the concerns of the other party and compromise. It is possible that the contractor gave a lowball bid, hoping to make his money on change orders and substandard materials, but hopefully this is not the case. That’s why it’s so important to hire a reputable contractor and to check references. It’s always easier to prevent problems than to solve them. Clear and complete plans and specifications, and a good contract, can go a long way toward helping avoid these types of problems. They, help align the expectations of both parties as to what is going to be built, at what cost, and what procedures should be followed along the way for allowances, change orders, and other routine issues that might arise .They may also help you resolve the small problems that inevitably arise on any job. The other key ingredients to a successful construction job are the people: an honest, competent contractor and a reasonable owner. The best contract in the world cannot turn a crook into an honest man. Both need to exercise some flexibility and be willing to work things out when small disagreements arise, as inevitably they will on any large construction job. No matter how much is put down on paper, there is still room for differences of opinion on some aspects of any job. When these arise, if there is goodwill and the spirit of give-and-take between the parties, these issues are usually resolved quickly and without hard feelings. In the absence of trust and goodwill, small conflicts can snowball into a project that goes off the tracks. It sounds like your main disagreements have to do with specifications (what type of cabinets and countertop materials should have been installed), the procedures and timing for you to make product selections, and their pricing. Perhaps the cost allowances and change-order procedures were also unclear. Of course this is all in hindsight – now you’ve got to move ahead. In general, contracts are better at better at preventing problems than solving them. Once things have gone off track and people are upset, contracts are less useful. They usually provide some guidance for resolving the conflicts, but by this point, no one is really paying attention to the contract anymore. The only way to enforce a contract is by litigation or arbitration. Arbitration, which is required by some contracts, can be a little shorter and cheaper than civil litigation, but is still not a practical approach to resolving disputes of this sort. Lawsuits can cost tens of thousands of dollars and drag on for years. And even if you win, you may end up collecting nothing because the contractor is bankrupt or nowhere to be found. People generally sue because they are angry and feel aggrieved, but this is the wrong reason to sue. A lawsuit requires a huge investment of time and money. It should be viewed as a business decision and only pursued if it makes business sense, which it rarely does. From my perspective, your first choice should be to attempt to work out a compromise. Both parties have a strong incentive to work out some type of resolution, since the prospect of going to court is so unpleasant and unrewarding; The main leverage either party has at this point is money. If you have paid the contractor for work not yet completed or products not yet delivered, then he has the upper hand. If you have more work completed than you have paid for, and you owe him money, then you have leverage. In any case, both parties will need to give up something up in a compromise. Decide what is most important to you and what you can live with. The best you can hope for, at this point, is a compromise resolution that leaves you both more-or-less equally unhappy. If you haven’t done so already, it’s important that you start documenting the sources of the conflict. Take dated photos of the substandard work or materials, keep copies of all written communications, and keep a dated log of all verbal communications — in case this does end up in mediation or court. Then, if possible, set a time to meet with the contractor to discuss your concerns. Let cooler heads prevail. Try to lower the emotions on both sides and approach this as a misunderstanding, not an intentional effort to swindle you (even if you think it is). Decide beforehand what your goals are. Do you want materials replaced, work redone, costs reduced, or something else? Explain clearly what you want and what you think is fair and see if you can reach a compromise. You may want to have a conversation with a lawyer before this meeting to get some advice on how best to proceed. If you do reach a compromise, put it in writing as an addendum to the contract or simply a letter agreement, signed by both parties, so you both have a written record of what you have agreed to. If you think an independent third party might be helpful in reaching a compromise, you could also explore hiring a mediator. The contractor would also need to agree to this process and both parties would to agree on who to hire and how to pay them. A mediator will try to move both parties toward a resolution, but their recommendations are non-binding. If a compromise is not possible, you may want to terminate the contract (due to a breach of contract) and hire another contractor to complete the work. In this case, I would definitely buy an hour or two of a lawyer’s time for guidance. Laws are different in every state, and to protect yourself, you want to act lawfully. For example, you may need to put some money in escrow or file certain papers.